Combining the protective forces of aromatherapy and apitherapy, our gum drops protect and enhance wellness for the mouth and throat. Made with organic Propolis, Honey, Rosemary, Lemon and Anis to be used for sore throats, singers, public speakers or anyone wanting a fresh breathe. 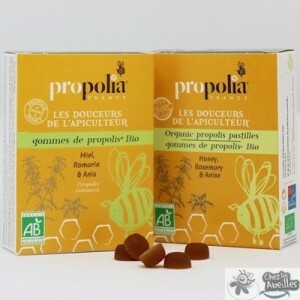 Our Propolis Lozenges Organic Honey & Rosemary, Anise are ideal to a soothe sore throat and freshen breath. 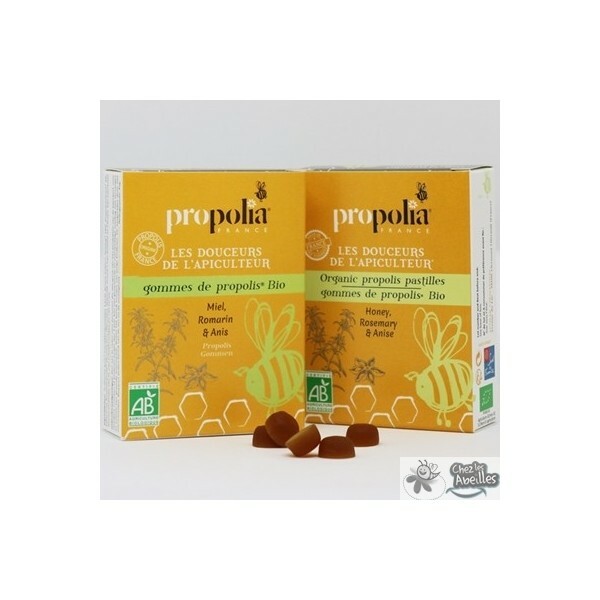 The combination of Propolis and Rosemary Essential Oil gives these lozenges powerful antiseptic properties which are added to the soothing actions of Arabic Gum and Honey. Their Anise and Lemon flavors give them an original and fresh taste. 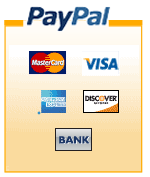 Gum Arabic* (47%), Brown Sugar*, Honey* (18%), Propolis Extracts* (3%), Anethol and Lemon Natural Flavors, Rosemary Essential Oil* (0, 0,2%).